The U.S. bank prime rate continues to be held steady, at 3.25 percent. Average rates on consumer rewards credit cards and business rewards credit cards moved in opposite directions in the first half of May, with the average rate for the consumer category rising while the average for the business category fell. These contradictory rate changes may be indicative of differing conditions in those two market segments, but more likely they are a reflection of changing goals and strategies on the part of specific credit card issuers. While it could be said that this movement in opposite directions reflects growing concerns about the health of consumer credit and an improving outlook for business balance sheets, in each case the movement was due to a change in just one of the credit card offers in their respective categories. This suggests the changes may have simply been individual business strategy adjustments on the part of the credit card companies issuing those cards, and not reflective of any broader trend. This is a reminder that it is always important to shop around for credit card rates, because different issuers react to the rate environment in different ways. 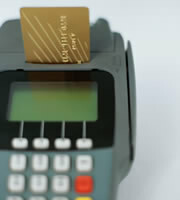 The overall average rate for consumer credit cards rose by 13 basis points, to 17.12 in the first half of May. This was due to a 19 basis point rise in the consumer rewards credit cards category, the first change in either consumer category since last October, and the first rise in rates since September. With the average rate on consumer rewards credit cards rising to 17.83 percent while the average for non-rewards cards held steady at 15.48 percent, the spread between the two increased to 2.35 percent. This spread represents the potential cost of participating in rewards programs. The best way to manage this cost is for consumers to pay the credit card balance in full each month -- if no interest is paid, there is no additional cost to the rewards program. Consumers who do carry balances forward from month to month should assess whether the financial benefit of the rewards they redeem is worth the extra amount of interest they are paying. The average rate for student credit cards remained at 17.56 percent, where it has been since February. The average rate on business non-rewards credit cards was unchanged at 14.99 percent, while the average rate for business rewards credit cards dropped by 10 basis points, to 15.31 percent. This lowered the spread between the two by that same 10 basis points, to 32 basis points. As with consumer credit cards, the higher rates charged for rewards programs reflects the potential additional costs of those programs. Notably though, this additional cost relative to non-rewards cards is now about 2 percentage points cheaper for business credit cards than for consumer credit cards. As with consumer credit cards though, the best strategy is to make rewards a cost-free benefit by paying the balance in full each month, and thus incurring no interest charges. The rate changes in the consumer credit card category were especially pronounced at the highest rate tier, which represents the rate charged to customers with the weakest credit histories. This raised the spread between the average rate for customers with excellent credit and the overall average by 8 basis points, to 4.01 percent. 0 Responses to "Consumer rewards credit card rates rise while business rates fall"